We passed a pet shop yesterday after school. Kids shouted very loud 'hamster'! I think they missed their hamsters. But if they ever asked me (which didn't happened yesterday), then my answer would still be no for the time being. I planned from last night to make 3D hamsters from hand mold rice but got lazy this morning, so I changed the plan and made this 2D running hamster. The round box will just be perfect for their running wheel. I use egg sheet to make the running hamster. I hope you all are not bored yet with the egg sheet. Please bear with me! I punched some music notes from nori but it kept shrinking when I put them on the top of the rice. I tried to use my music note picks but they are too big, just didn't match with the hamster. So inside the kids' bento no music notes, I put those 'fake' music notes for the picture only. Inside the other round box : fish with soy sauce & ginger sprinkled with sesame seeds, stir fried Chinese cabbage & carrots, and stir fried green yong tofu. I got the green yong tofu from the supermarket couple days ago from the chiller section. The texture is firmer than tofu, tastes a bit salty like fish cake. The hamster look so cute with the music notes cliparts! Perfect! Btw, I've got some smaller sizes of music note picks from Daiso which I think may fit into your box. Maybe you could check out from your local Daiso or BentoCrafts carries them too. I never get bored with your egg sheet creation. The hamster is just like me when i was on the treadmill 3 years ago. hahaha..now, i'm too lazy to do it. I love egg sheet ! I tried last week making flowers in my bento, that was pretty hard ^^ I hope one day I will make bento as beautiful as yours ! @The Little Welsh : Thanks a lot Emma! I always cook my rice with 1:1,5 (1 cup rice : 1,5 cups water) so it moists and not too dry. My kids love it that way. Others perhaps will use another method. And I use regular short grain rice. You need to rinse and drain the rice few times. It does make a difference in taste. It seems ok until lunch hour. Will dry up a little bit at the top but still moist inside. @Oen Priyanto : hehehe ... should be a happy and fast beat song :) Thanks a lot for your comment! Looks awesome as usual. Will attempt egg sheet cutting one fine fine day  thanks for the inspiration as always Lia. Run baby ruuuuun! So cute hamster!! Loved the earphones ^__^! eeks, this hamster is so cute in his wheel! love his little red nose and his running pose, with his perfect walkman! i have had nori-shrinking problems lately too; great idea to add the notes with photoshop. soy-ginger fish looks so tasty, making my mouth water! Great artwork! How long do you usually take in the morning to make your kids' bentos? Do you make fresh egg sheets each day? What do you do with the rest of the egg sheets that you don't use, can you reuse them for the next morning or do they get weird in texture/taste? You seem to use food colouring a lot for your egg sheets, but how safe is it? @karaimame : hahaha ... Thanks a lot Lilian for your cute comment! Is that ever cool or what?! I love it! 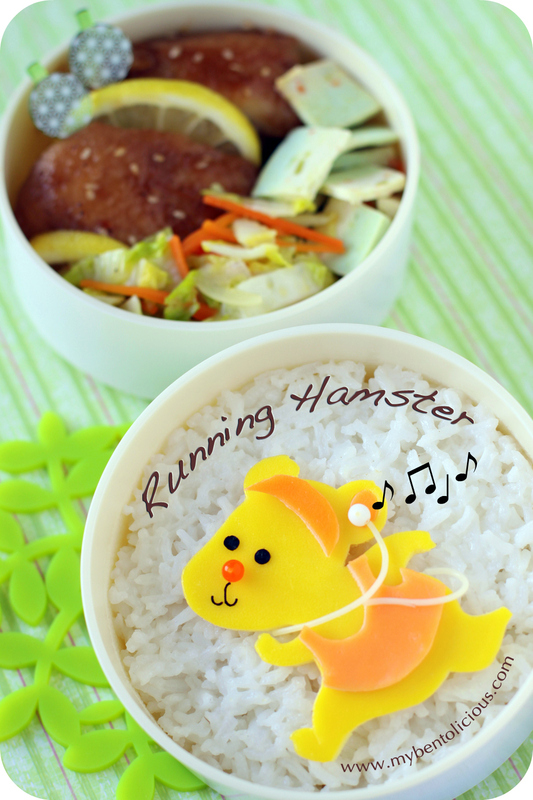 Round bento box goes so well with your running hamster.. omg, even head phones?? Amazingly so well thought out Lia! Thanks for your reply about my rice question! I use long grain rice - for when I cook Chinese food, I should buy some short grain for when I want to put it in the lunch boxes! Thanks for the advice! Would you do a tutorial on making your gorgeous egg sheets? Amazing creativity and details here Lia, I'm sitting here with my mouth open! Your kawaii artistry is simple incredible. My rainy chilly afternoon here has just been warmed up by your charming bento art, thank you!! I always admire your eggsheet cutting skill! I am even still too intimidated trying to make an eggsheet myself ;). Do you have a tutorial on how to make an eggsheet?